New Year’s FREE Writing Activity: 12 Prompts to Count Down to Midnight! Need a twist on a middle or high school ELA activity that reflects on the old year and sets goals for the new one? Want easy homework to keep them writing over winter break, survive until the last day, or just kick off the first day back from school? 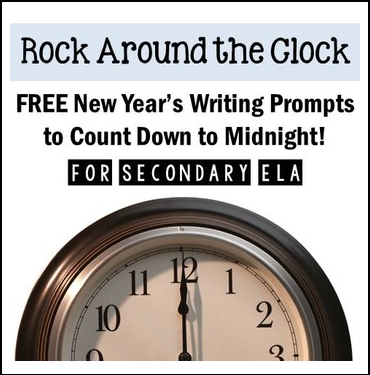 Use either version of this FREE activity – one general, and one ELA-specific – to give students a checklist of short, authentic writing tasks to “count down” until midnight! Download NOW to see a variety of prompts asking students to reflect, set goals, identify lessons learned, thank people, preserve memories, and build a positive mindset of things to look forward to in 2015. ***Want to see a fuller, editable version of this activity? Check out my New Year's Writing Project/Menu, with 40 prompts, a rubric, and more for only $2! Fonts courtesy of KG Fonts. Ready for other seasonal materials?